NVIDIA (NASDAQ:NVDA) reported its fourth quarter earnings for the fourth quarter of the fiscal year of 2018 (calendar year 2017) and the results have been nothing short of spectacular. The company has set a record on pretty much every category, beating not only he revenue expectations but the earnings expectation as well. The company posted a GAAP EPS of $1.78 which is up 80% from a year ago, on revenue of $2.91 Billion. NVIDIA (NASDAQ:NVDA) returned $1.25 billion to shareholders through a combination of $909 million in share repurchases and $341 million in quarterly cash dividends. For fiscal 2019, NVIDIA intends to return $1.25 billion to shareholders through ongoing quarterly cash dividends and share repurchases. NVIDIA will pay its next quarterly cash dividend of $0.15 per share on March 16, 2018, to all shareholders of record on February 23, 2018. Ethics disclaimer: I own no stock in NVIDIA or the surrounding ecosystem and do not plan to do so for the immediate future. This has been a pretty wild quarter for the company, and thats saying something considering NVIDIA is one of the most consistently reliable corporations out there. The Tesla V100 (volta based) accelerators were intro-ed and their focus on AI and machine learning grew. The company was able to add 34 GPU accelerated systems to the Top500 supercomputer list which is no mean feat. The Max-Q design philosophy was introduced which allows AIBs to manufacture high performance laptop in small form factors. 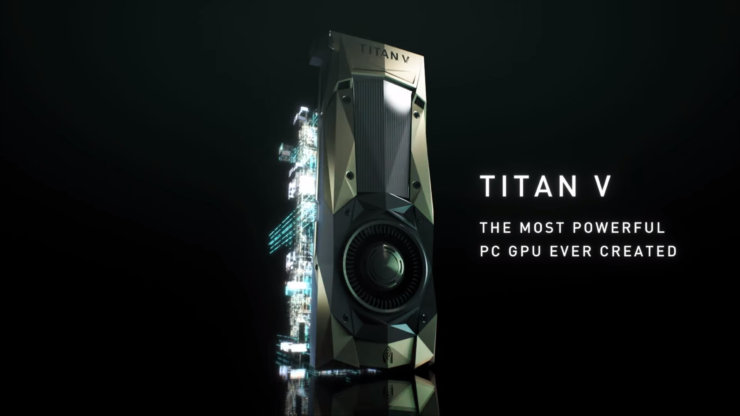 Keep in mind however, that this form factor has some downsides (such as an extended keyboard, heating concerns etc) as well and may not the be cure that NVIDIA is claiming it to be. Probably the most interesting aspect of their quarter however, was their diversification into the television/monitor market with what they are calling the BFGDs or the Big Format Gaming Displays. Since they are now entering an entirely new industry, this warrants an increased P/E multiplier. That said, as we iterate every time, NVIDIA’s P/E is very very high and while they have consistently beaten expectations, it is definitely something to take into account when thinking of investing into the stock. The company also announced and demonstrated the DRIVE Xavier platform and has seen significant growth in the AI sector. Perhaps another reason for NVIDIA’s success can be attributed to the fact that AMD’s Radeon side was mostly MIA this time around with the top performance bracket easily occupied by the GTX 1080 and GTX 1080 Ti. Because AMD had been focusing on their Zen efforts, RTG suffered and it shows as increased market share and ARPU for NVIDIA. It goes without saying that the cyrpto-mining craze and the exorbitant pricing helped drive the company into their most profitable quarter yet. This also where we would urge caution, it is clear that a significant portion of their graphics revenue comes from miners who are willing to buy a GTX 1080 Ti at insane price levels. If that demand side ever evaporates (this is especially pertinent given the ongoing cryptocurrency crash) it would become very hard for NVIDIA to maintain its current streak. Still, the company has continued to beat expectations and its more likely that they will continue to do so then not. Fourth quarter revenue increased 34 percent year over year and 10 percent sequentially to a record $2.91 billion. Growth was driven by GPUs for gaming, datacenter, and professional visualization, as well as by Tegra® processors. GPU business revenue was $2.46 billion, up 33 percent from a year earlier and up 11 percent sequentially, led by growth in gaming and datacenter. Strong growth across our Pascal-based GeForce gaming GPUs was driven by new games, holiday-season demand, iCafe upgrades, eSports and cryptocurrency mining. Revenue for datacenter, including Tesla, NVIDIA GRID and NVIDIA DGX, was a record $606 million, up 105 percent year on year and up 21 percent sequentially, led by strong sales of our Volta architecture, including V100 GPU accelerators, new DGX systems, and design wins in high performance computing. Professional visualization revenue grew 13 percent year over year and 6 percent sequentially to a record $254 million, led by ultra-high-end and high-end desktop workstations, as well as unique form factors and emerging opportunities, including AI, deep learning, VR and rendering. Tegra Processor business revenue, which includes gaming development platforms and services, was $450 million, up 75 percent from a year ago and up 7 percent sequentially. Tegra Processor business revenue includes SOC modules for the Nintendo Switch gaming console and development services. Also included is automotive revenue of $132 million, which was up 3 percent from a year earlier and down 8 percent sequentially, incorporating infotainment modules, production DRIVE PX platforms, and development agreements for self-driving cars. Revenue from our patent license agreement with Intel concluded in the first quarter of fiscal 2018. Fiscal 2018 revenue grew 41 percent to a record $9.71 billion, reflecting broad growth and records in each of our market platforms — gaming, professional visualization, datacenter, and automotive. 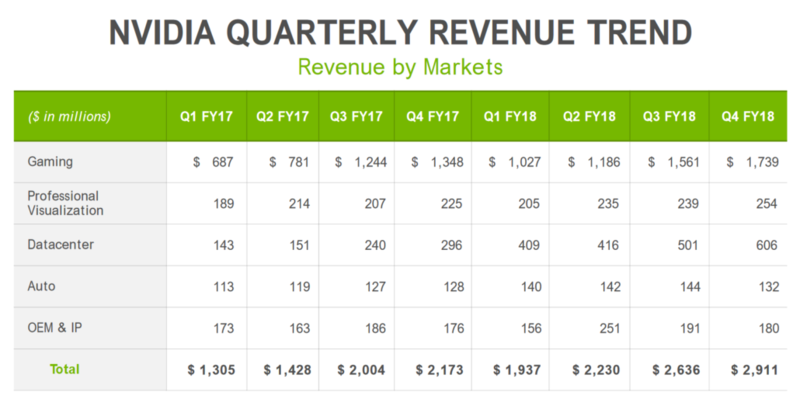 GPU business revenue was $8.14 billion, up 40 percent from a year earlier, and Tegra business revenue was $1.53 billion, up 86 percent from a year ago. GAAP and non-GAAP tax rates are both expected to be 12.0 percent, plus or minus one percent, excluding any discrete items. GAAP discrete items include excess tax benefits or deficiencies related to stock-based compensation, which we expect to generate variability on a quarter by quarter basis. Capital expenditures are expected to be approximately $100 million to $120 million.